From the twisted mind of Dale A. Hildebrandt comes a collection of 13 items for your perusal. 1st edition 2015, 27 pages. I have enjoyed a number of Dale Hildebrandt's offerings in the past. 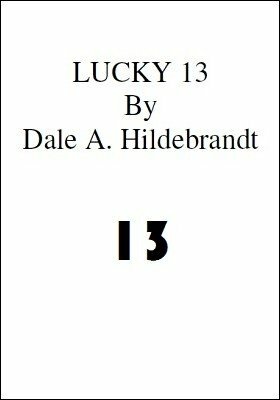 When I spotted Lucky 13 I was especially enthusiastic about the first offering using a person's own computer. Unfortunately, the premise upon which the method is based is Windows XP based and there are less and less of them every year. Otherwise, Mr. Hildebrandt is clearly targeting readers who have a well established library and a closet full of magic gadgets in this nice little book. His writing and thinking never fail to inspire me to take another look at some of the old books, methods and my own magic junk drawer. At a dollar a trick or essay, I'd say that its a pretty decent price.